On 10 November, the conservative Passos Coelho government in Portugal, in office since 2011, fell. It is likely to be replaced by a government of the Socialist Party (SP, similar to pre-Corbyn Labour) supported by the Portuguese Communist Party and the Left Bloc. Passos Coelho has carried through Portugal’s mandated cuts programme since it applied for a eurozone “bailout” in April 2011. The SP, which had gone for the bailout, crashed in parliamentary elections in June 2011. Read more about Portugal: settling for neoliberalism? Portugal’s revolution began on 25 April 1974, set in motion by a military coup against the country’s nearly-50-year-old fascist regime. It was effectively ended by another coup on 25 November 1975. Portugal started 1974 as a backward, isolated colonial power run by an authoritarian regime, and began 1976 as a state without colonies, on its way to becoming a stable bourgeois democracy, integrated into European capitalism. Mark Osborn tells the story. The ferment in Portugal reached its peak in summer 1975. The old top military command had been marginalised by the failure of its attempted coups on 28 September 1974 and 11 March 1975. Power was in the hands of the loose-knit Armed Forces Movement (AFM), middle-rank officers, some close to the Socialist Party, some close to the Communist Party. The Fifth Provisional Government, in office from 8 August to 19 September, was close to the CP. 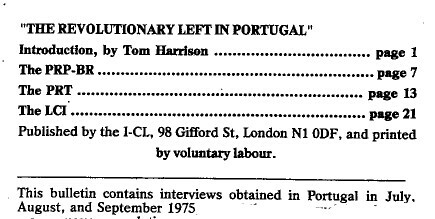 Text edited from International-Communist League pamphlet, The Revolutionary Left in Portugal (1977). Portuguese Trotskyism entered the country via Paris after a couple of Portuguese students had been influenced by the ideas of the USFI [mainstream orthodox Trotskyists led by Ernest Mandel] in 1968. Documents from the discussions of Workers' Fight and the International-Communist League with the Portuguese revolutionary left, 1975-6. Miguel Perez, a Lisbon-based socialist activist and historian who delivered a talk on the Portuguese Revolution of 1974-5, spoke to Solidarity about his view of events. On 5 April the Portuguese constitutional court ruled that some of the sweeping new government cuts (to holiday bonuses for civil servants and pensioners, unemployment and sickness benefits) were unlawful (5 April) were unlawful. But Prime Minister Pedro Passos Coelho responded by reiterating his right-wing government’s intention to make the cuts. He says cuts are obligatory under the terms of an €78 billion EU/IMF bailout deal. The court held that the tax rises which will take place under the 2013 budget are legal. Spain’s two main union confederations, UGT and CCOO, called a one-day general strike on 29 March over issues similar to those sparking the strike wave in Italy. In a country with 23% unemployment, the new conservative government wants to change the law to make it easier for employers to sack workers. The executives of UGT and CCOO met jointly, for the first time in history, on 9 March, to decide to call the strike.